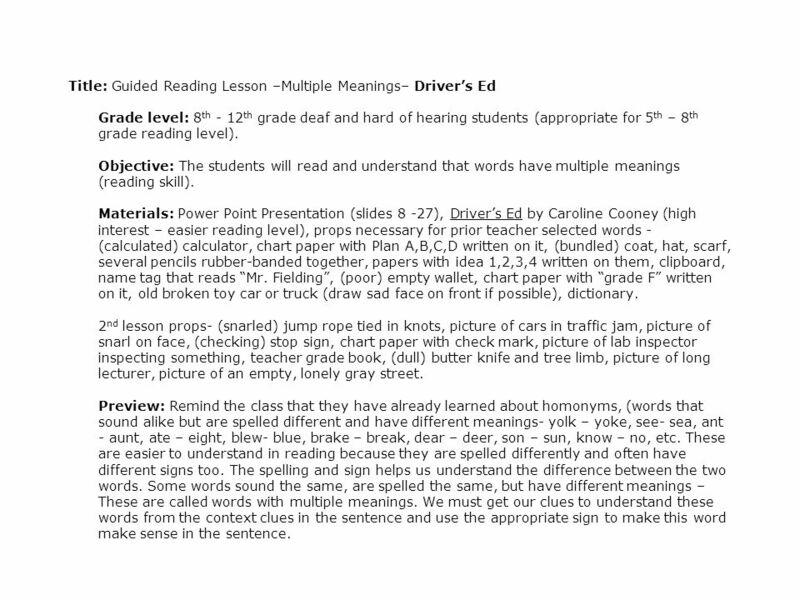 Guided Reading – Exploring Multiple Meanings Drivers Ed by Caroline Cooney Target:Reluctant readers who are deaf/hard of hearing. Age-range:Intended for. 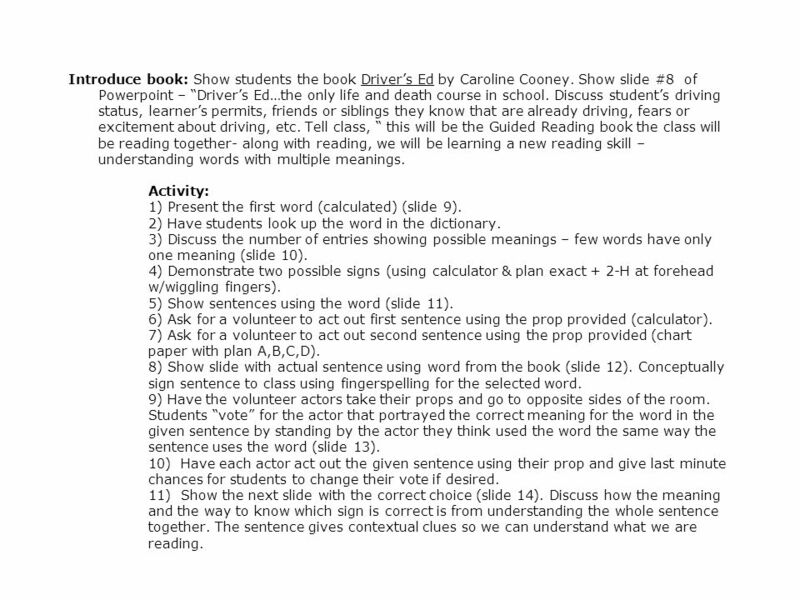 3 Title: Guided Reading Lesson –Multiple Meanings– Drivers Ed Grade level: 8 th - 12 th grade deaf and hard of hearing students (appropriate for 5 th – 8 th grade reading level). Objective: The students will read and understand that words have multiple meanings (reading skill). Materials: Power Point Presentation (slides 8 -27), Drivers Ed by Caroline Cooney (high interest – easier reading level), props necessary for prior teacher selected words - (calculated) calculator, chart paper with Plan A,B,C,D written on it, (bundled) coat, hat, scarf, several pencils rubber-banded together, papers with idea 1,2,3,4 written on them, clipboard, name tag that reads Mr. Fielding, (poor) empty wallet, chart paper with grade F written on it, old broken toy car or truck (draw sad face on front if possible), dictionary. 2 nd lesson props- (snarled) jump rope tied in knots, picture of cars in traffic jam, picture of snarl on face, (checking) stop sign, chart paper with check mark, picture of lab inspector inspecting something, teacher grade book, (dull) butter knife and tree limb, picture of long lecturer, picture of an empty, lonely gray street. Preview: Remind the class that they have already learned about homonyms, (words that sound alike but are spelled different and have different meanings- yolk – yoke, see- sea, ant - aunt, ate – eight, blew- blue, brake – break, dear – deer, son – sun, know – no, etc. These are easier to understand in reading because they are spelled differently and often have different signs too. The spelling and sign helps us understand the difference between the two words. Some words sound the same, are spelled the same, but have different meanings – These are called words with multiple meanings. We must get our clues to understand these words from the context clues in the sentence and use the appropriate sign to make this word make sense in the sentence. 4 Props to act out the multiple meanings should not be complicated. These items should be things that can be made quickly or collected without a lot of effort. 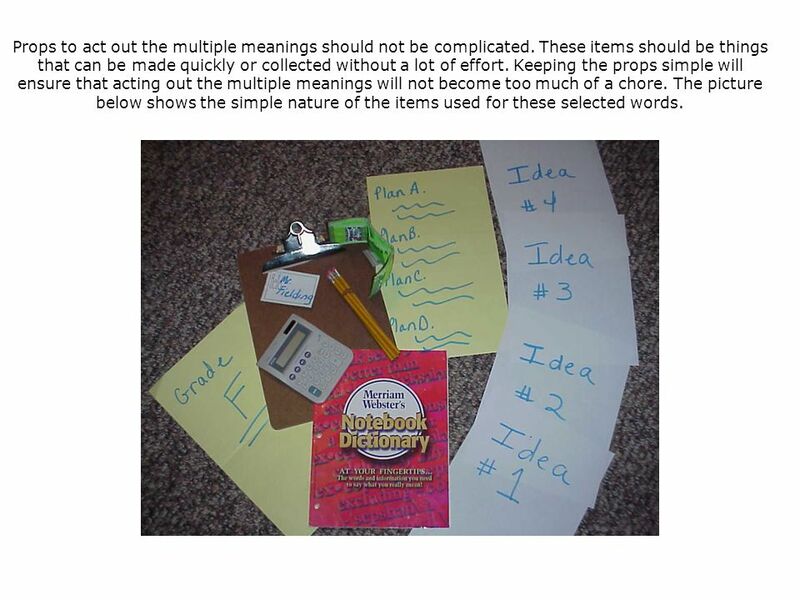 Keeping the props simple will ensure that acting out the multiple meanings will not become too much of a chore. The picture below shows the simple nature of the items used for these selected words. 5 Introduce book: Show students the book Drivers Ed by Caroline Cooney. Show slide #8 of Powerpoint – Drivers Ed…the only life and death course in school. Discuss students driving status, learners permits, friends or siblings they know that are already driving, fears or excitement about driving, etc. Tell class, this will be the Guided Reading book the class will be reading together- along with reading, we will be learning a new reading skill – understanding words with multiple meanings. 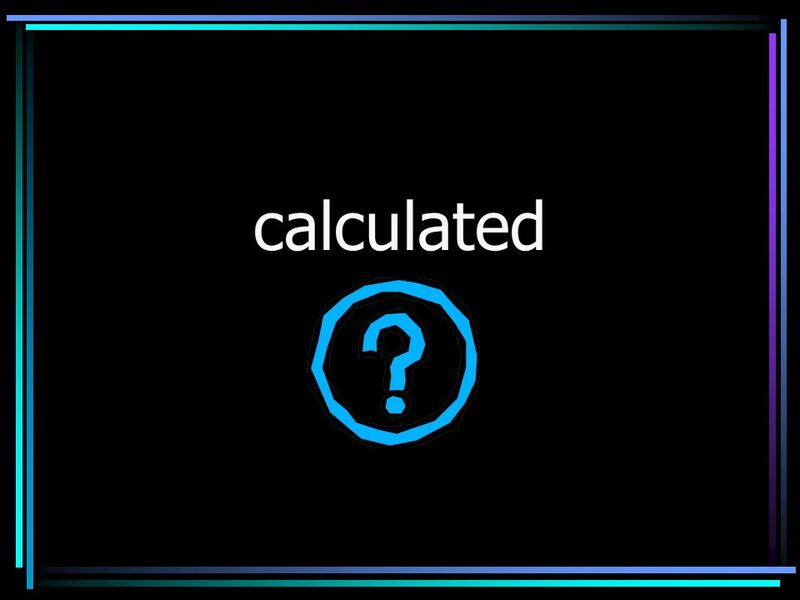 Activity: 1) Present the first word (calculated) (slide 9). 2) Have students look up the word in the dictionary. 3) Discuss the number of entries showing possible meanings – few words have only one meaning (slide 10). 4) Demonstrate two possible signs (using calculator & plan exact + 2-H at forehead w/wiggling fingers). 5) Show sentences using the word (slide 11). 6) Ask for a volunteer to act out first sentence using the prop provided (calculator). 7) Ask for a volunteer to act out second sentence using the prop provided (chart paper with plan A,B,C,D). 8) Show slide with actual sentence using word from the book (slide 12). Conceptually sign sentence to class using fingerspelling for the selected word. 9) Have the volunteer actors take their props and go to opposite sides of the room. Students vote for the actor that portrayed the correct meaning for the word in the given sentence by standing by the actor they think used the word the same way the sentence uses the word (slide 13). 10) Have each actor act out the given sentence using their prop and give last minute chances for students to change their vote if desired. 11) Show the next slide with the correct choice (slide 14). Discuss how the meaning and the way to know which sign is correct is from understanding the whole sentence together. The sentence gives contextual clues so we can understand what we are reading. 6 Next Word 1) Present the second word (bundled) (slide 15). 2) Have students look up the word in the dictionary. Discuss the number of entries showing possible meanings (slide 16 ). 3)Show the possible signs (hat - jacket – hug, CL: 2H-claw coming together, point to thumb through little finger of opposite hand, encourage – guide). 4) Show sentences using the word (slide 17). 5) Ask for a volunteer to act out first sentence using the prop provided (hat, coat, scarf). 6) Ask for a volunteer to act out the next sentence using the prop provided (pencils and rubber-band). 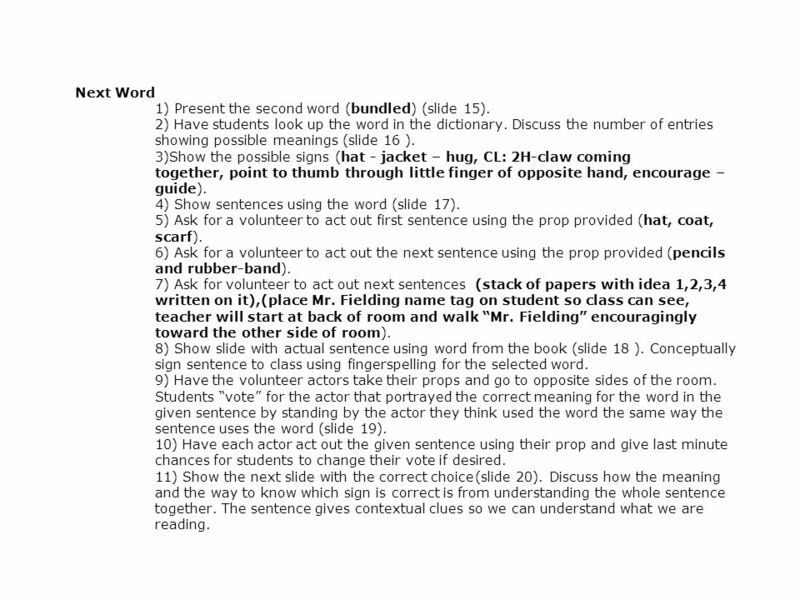 7) Ask for volunteer to act out next sentences (stack of papers with idea 1,2,3,4 written on it),(place Mr. Fielding name tag on student so class can see, teacher will start at back of room and walk Mr. Fielding encouragingly toward the other side of room). 8) Show slide with actual sentence using word from the book (slide 18 ). Conceptually sign sentence to class using fingerspelling for the selected word. 9) Have the volunteer actors take their props and go to opposite sides of the room. Students vote for the actor that portrayed the correct meaning for the word in the given sentence by standing by the actor they think used the word the same way the sentence uses the word (slide 19). 10) Have each actor act out the given sentence using their prop and give last minute chances for students to change their vote if desired. 11) Show the next slide with the correct choice(slide 20). Discuss how the meaning and the way to know which sign is correct is from understanding the whole sentence together. The sentence gives contextual clues so we can understand what we are reading. 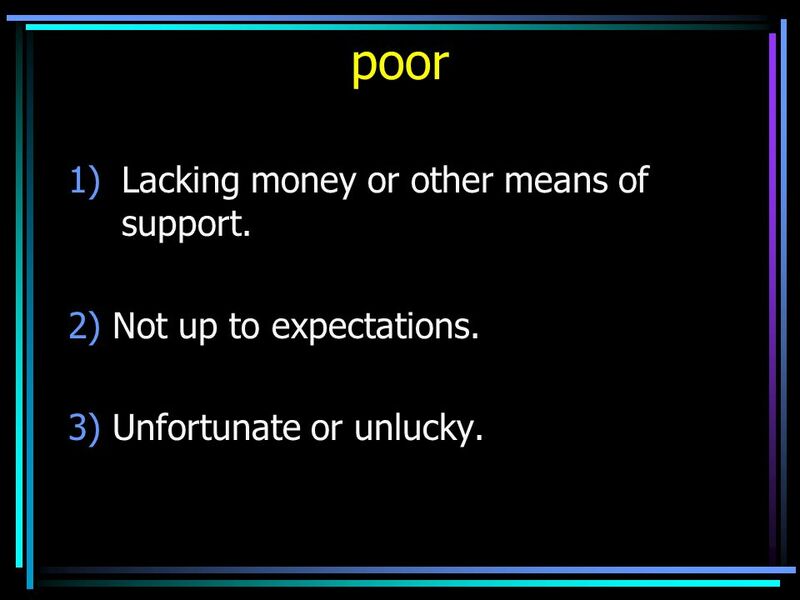 7 Next word 1) Present the word (poor) (slide 21). 2) Have students look up the word in the dictionary. Discuss the number of entries showing possible meanings (slide 22). 3) Show the possible signs (CL: claw pulling at elbow, bad, pity). 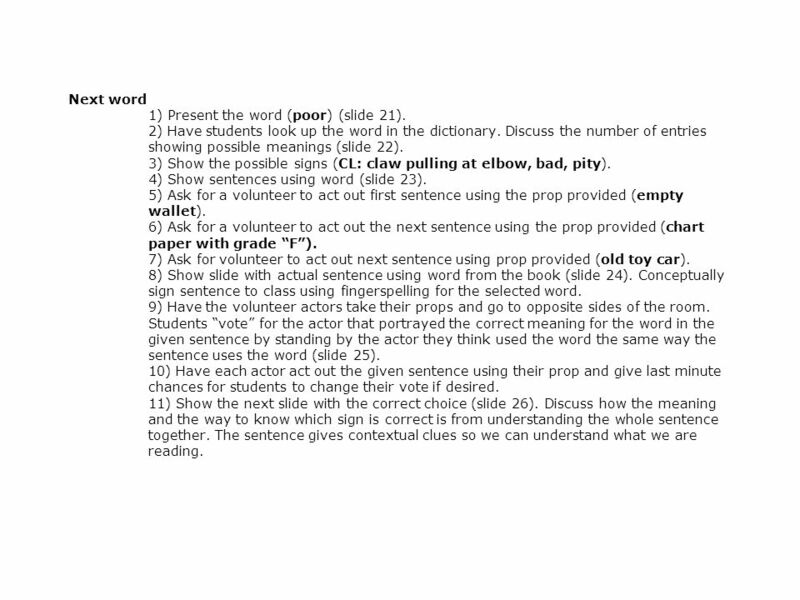 4) Show sentences using word (slide 23). 5) Ask for a volunteer to act out first sentence using the prop provided (empty wallet). 6) Ask for a volunteer to act out the next sentence using the prop provided (chart paper with grade F). 7) Ask for volunteer to act out next sentence using prop provided (old toy car). 8) Show slide with actual sentence using word from the book (slide 24). Conceptually sign sentence to class using fingerspelling for the selected word. 9) Have the volunteer actors take their props and go to opposite sides of the room. Students vote for the actor that portrayed the correct meaning for the word in the given sentence by standing by the actor they think used the word the same way the sentence uses the word (slide 25). 10) Have each actor act out the given sentence using their prop and give last minute chances for students to change their vote if desired. 11) Show the next slide with the correct choice (slide 26). Discuss how the meaning and the way to know which sign is correct is from understanding the whole sentence together. The sentence gives contextual clues so we can understand what we are reading. 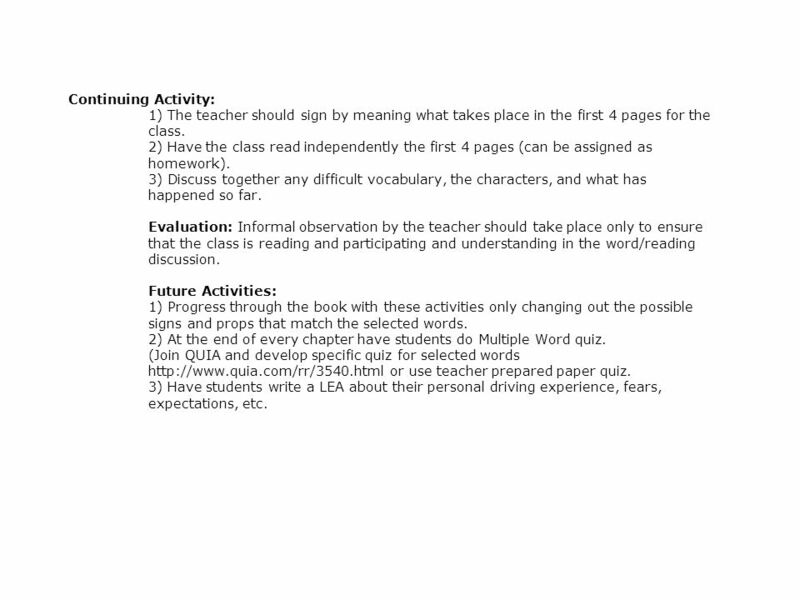 8 Continuing Activity: 1) The teacher should sign by meaning what takes place in the first 4 pages for the class. 2) Have the class read independently the first 4 pages (can be assigned as homework). 3) Discuss together any difficult vocabulary, the characters, and what has happened so far. Evaluation: Informal observation by the teacher should take place only to ensure that the class is reading and participating and understanding in the word/reading discussion. Future Activities: 1) Progress through the book with these activities only changing out the possible signs and props that match the selected words. 2) At the end of every chapter have students do Multiple Word quiz. (Join QUIA and develop specific quiz for selected words http://www.quia.com/rr/3540.html or use teacher prepared paper quiz. 3) Have students write a LEA about their personal driving experience, fears, expectations, etc. 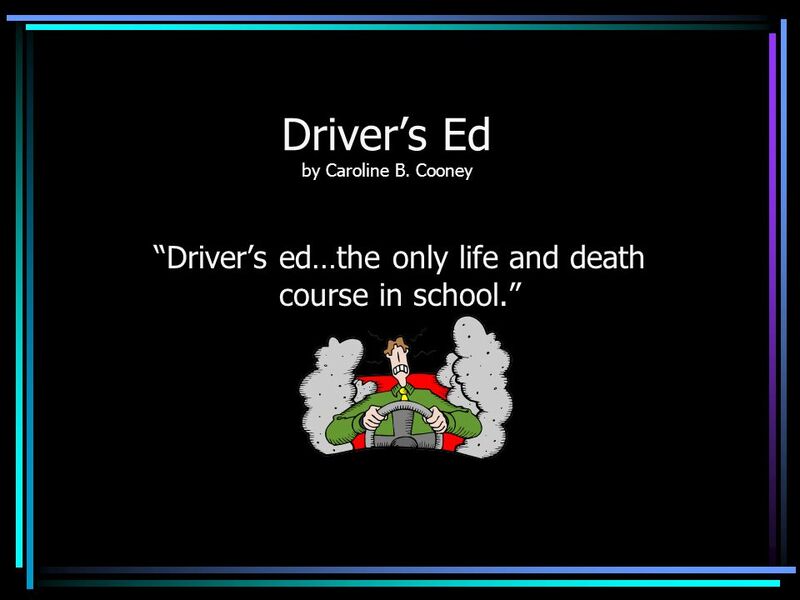 9 Drivers Ed by Caroline B. Cooney Drivers ed…the only life and death course in school. 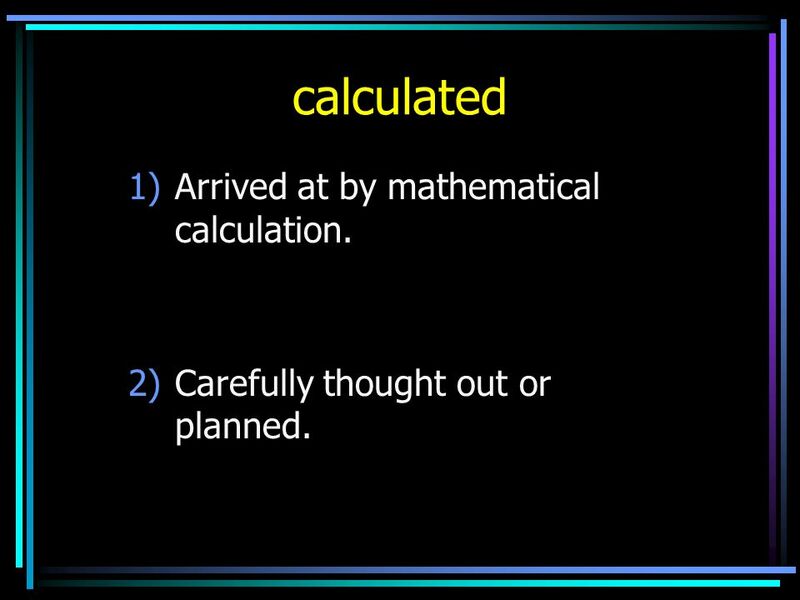 11 1)Arrived at by mathematical calculation. 2)Carefully thought out or planned. 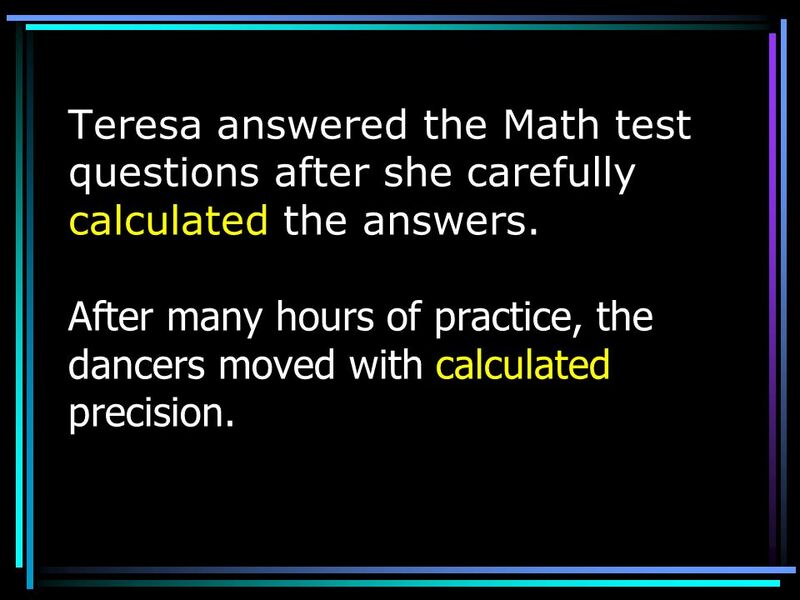 12 Teresa answered the Math test questions after she carefully calculated the answers. After many hours of practice, the dancers moved with calculated precision. 13 This was not clumsiness. It was calculated. 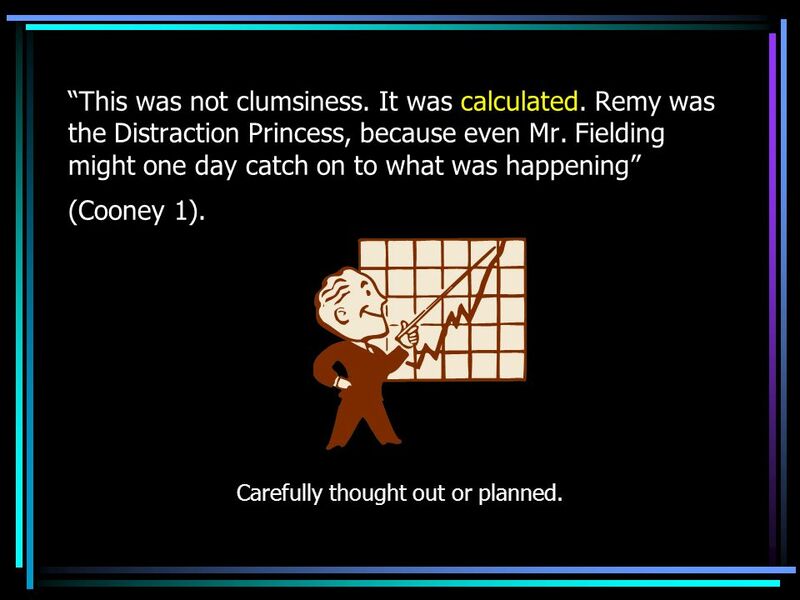 Remy was the Distraction Princess, because even Mr. Fielding might one day catch on to what was happening (Cooney 1). 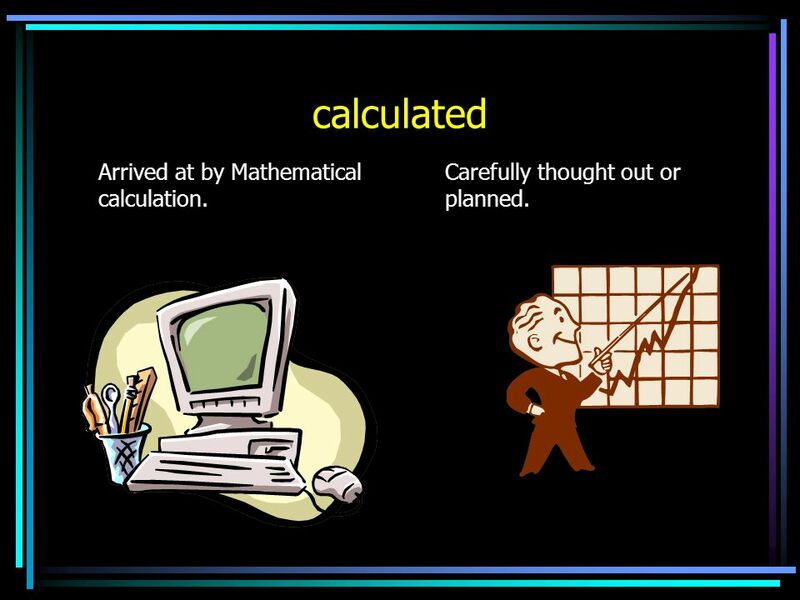 14 calculated Arrived at by Mathematical calculation. Carefully thought out or planned. 15 This was not clumsiness. It was calculated. 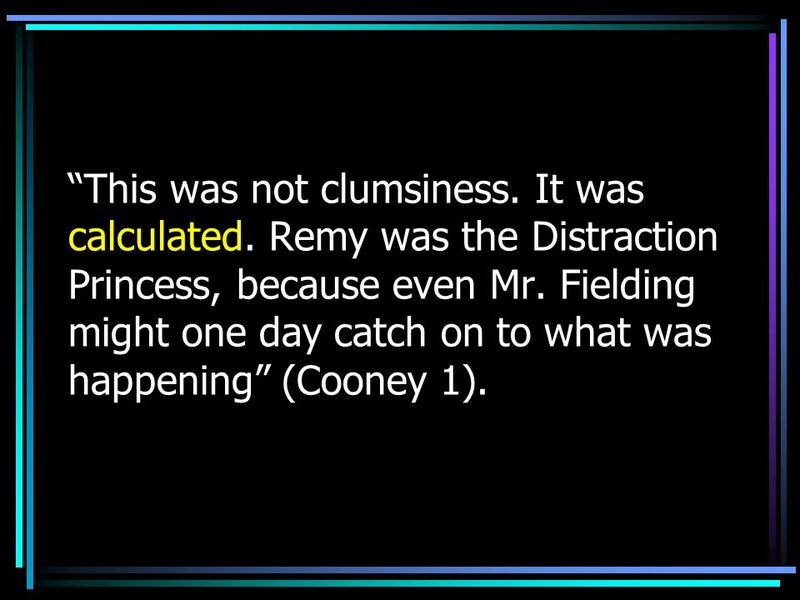 Remy was the Distraction Princess, because even Mr. Fielding might one day catch on to what was happening (Cooney 1). Carefully thought out or planned. 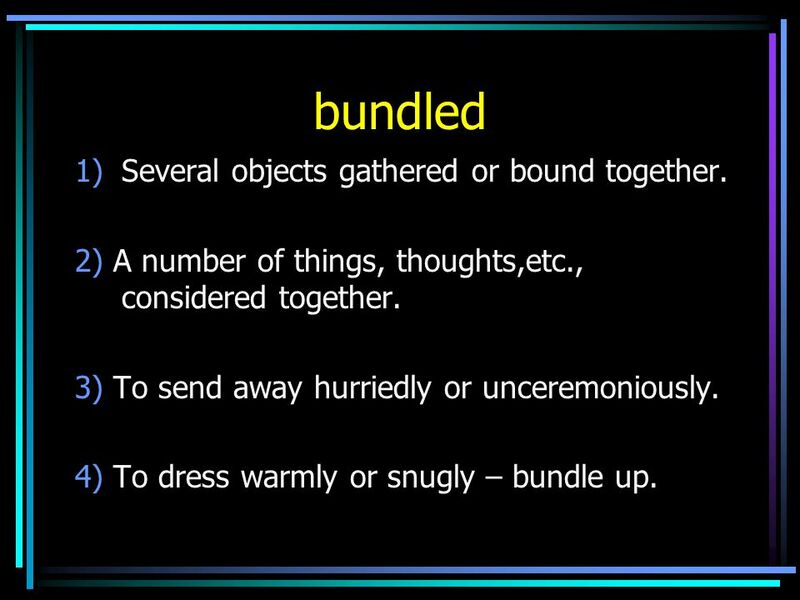 17 1)Several objects gathered or bound together. 2) A number of things, thoughts,etc., considered together. 3) To send away hurriedly or unceremoniously. 4) To dress warmly or snugly – bundle up. 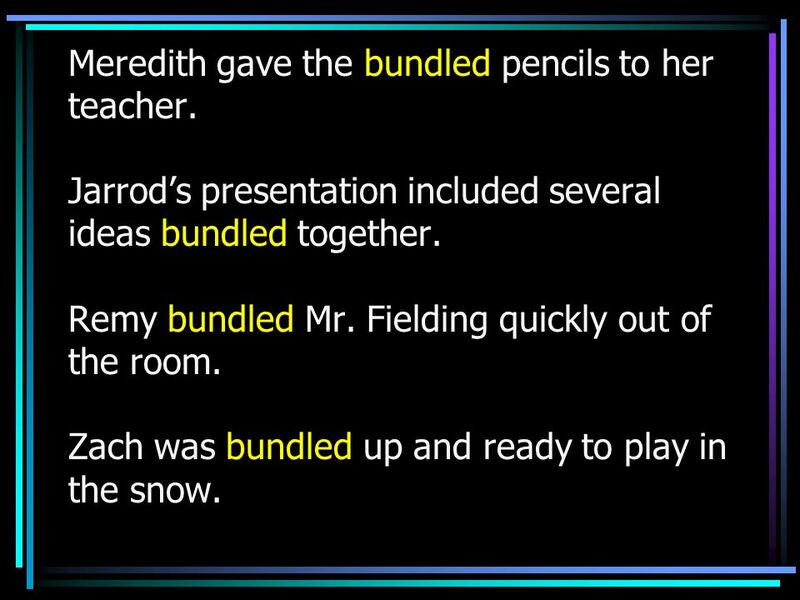 18 Meredith gave the bundled pencils to her teacher. Jarrods presentation included several ideas bundled together. Remy bundled Mr. Fielding quickly out of the room. Zach was bundled up and ready to play in the snow. 19 Remy bundled Mr. Fielding through the library. She had to set the pace or half the period would be wasted just approaching the Drivers Ed car (Cooney, 2). 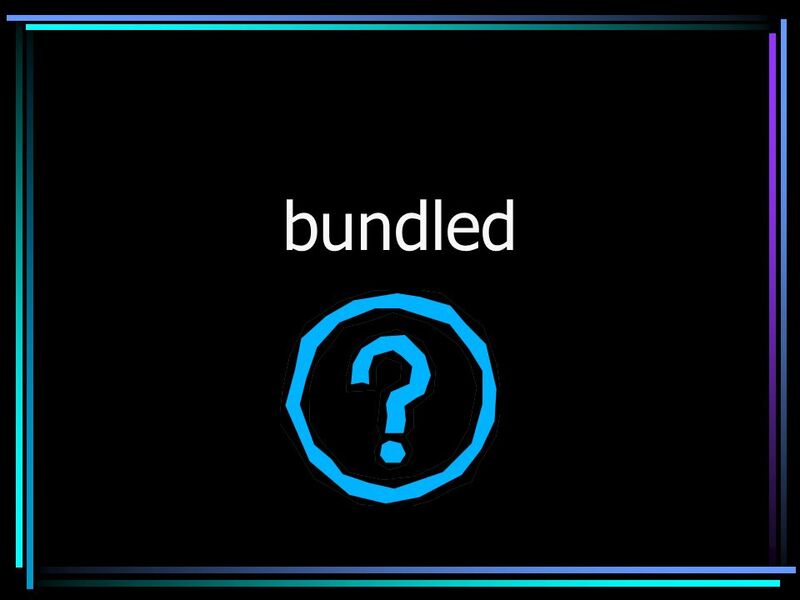 20 bundled Several objects bound together. To send away hurriedly. A number of thoughts considered together. To dress warmly or snugly. 21 Remy bundled Mr. Fielding through the library. 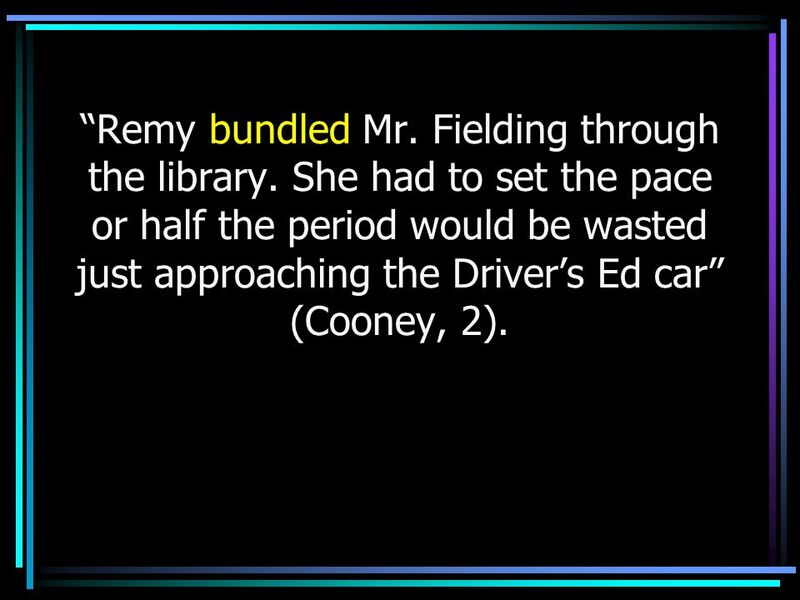 She had to set the pace or half the period would be wasted just approaching the Drivers Ed car (Cooney, 2). To send away hurriedly or unceremoniously. 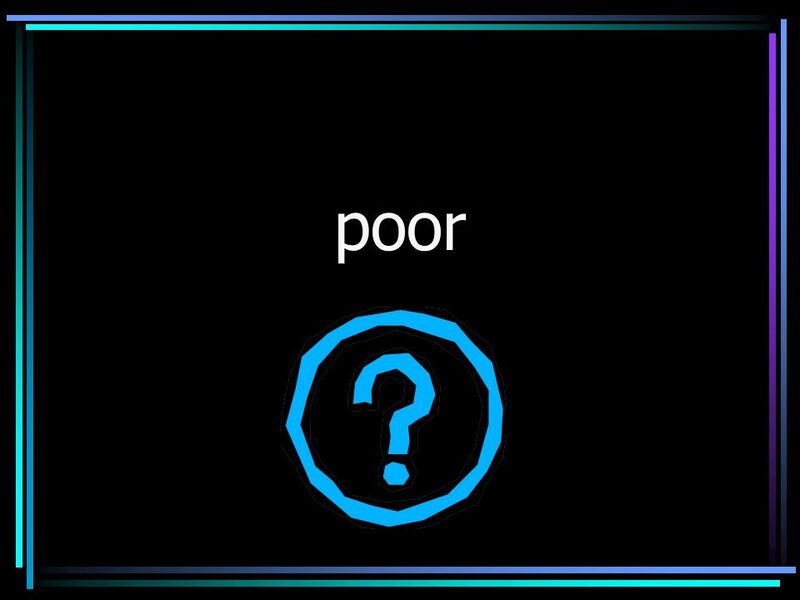 23 1)Lacking money or other means of support. 2) Not up to expectations. 3) Unfortunate or unlucky. 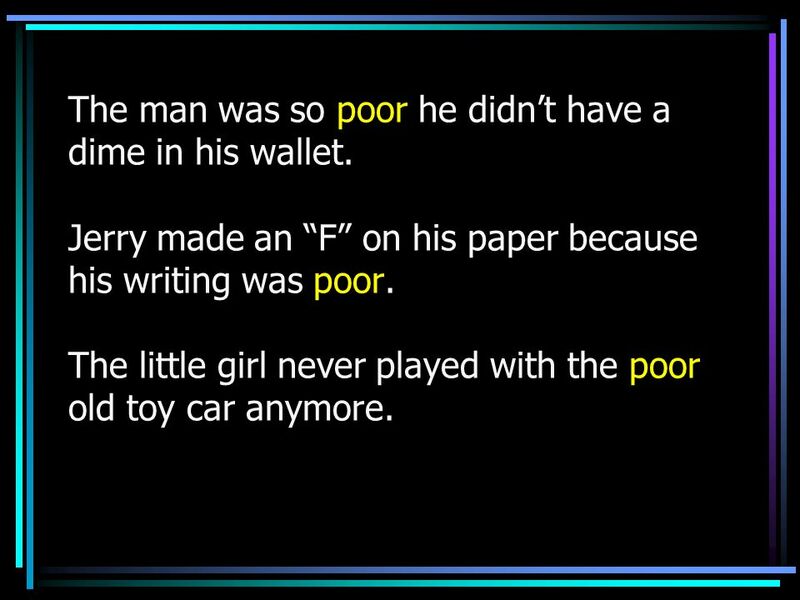 24 The man was so poor he didnt have a dime in his wallet. Jerry made an F on his paper because his writing was poor. The little girl never played with the poor old toy car anymore. 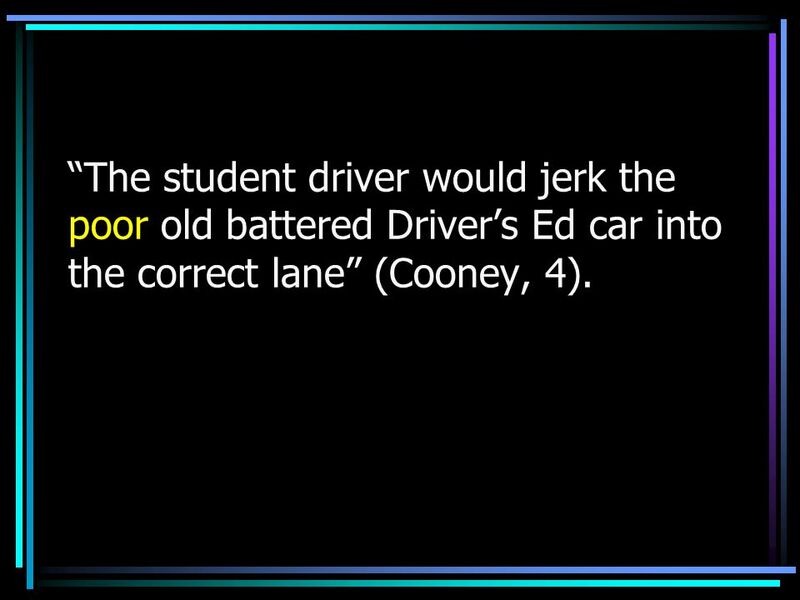 25 The student driver would jerk the poor old battered Drivers Ed car into the correct lane (Cooney, 4). 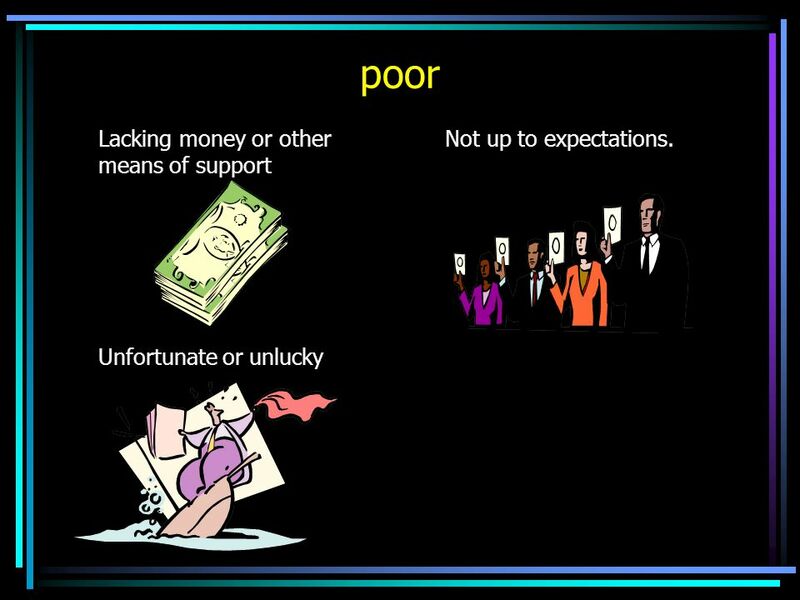 26 poor Lacking money or other means of support Unfortunate or unlucky Not up to expectations. 27 The student driver would jerk the poor old battered Drivers Ed car into the correct lane (Cooney, 4). Unfortunate or unlucky. 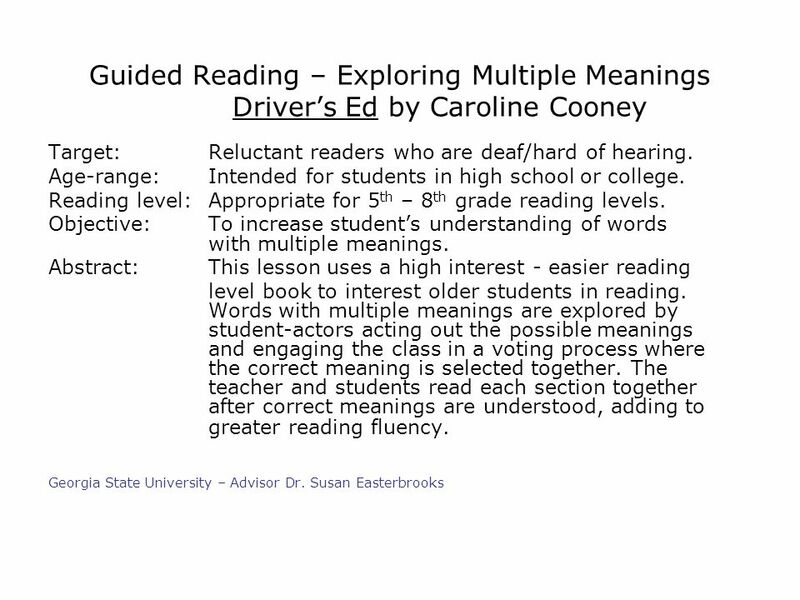 Download ppt "Guided Reading – Exploring Multiple Meanings Drivers Ed by Caroline Cooney Target:Reluctant readers who are deaf/hard of hearing. Age-range:Intended for." Time Sheet Training Press the F5 Key to view the Presentation. It may be helpful to have a printed copy of this slide presentation for the practice sessions. Práctica con el verbo tener 1.I have a notebook. 2.She has a pen. 3.They have a car. 4.We have some notebooks. 5.You have a pencil. Copyright 2008, Scott Gray 1 How to Read a Book. Copyright 2008, Scott Gray 2 Initial Assignment Read the back cover. Break the book in. Read the preface. Child Development 1 st Nine Weeks. Weekly Warm-Up August 27 & 28, 2013 First Day! No Warm Up. Remember: o Write the warm-up question, statement, etc. ESL Training MOST Ministries. 2 Camp Overview Overnight Camp –Classes in morning –Activities in afternoon Longer periods of recreation, music, crafts. 5-1 Chapter 5: Stages and Strategies in Second Language Acquisition With a Focus on Listening and Speaking ©2012 California Department of Education, Child.